Sunday’s action at the 2018 World Series of Poker ended with two new bracelet winners, a monster day in the MONSTER STACK, and a stacked line-up advancing in the freshly-started Razz event. Read all about those winners, plus all the other news, in our recap from June 24. The first of Sunday’s two new bracelet winners had to overcome a tough final table, one which included a six-time bracelet winner and last year’s Player of the Year, and another bracelet winner seeking their second piece of jewellery. 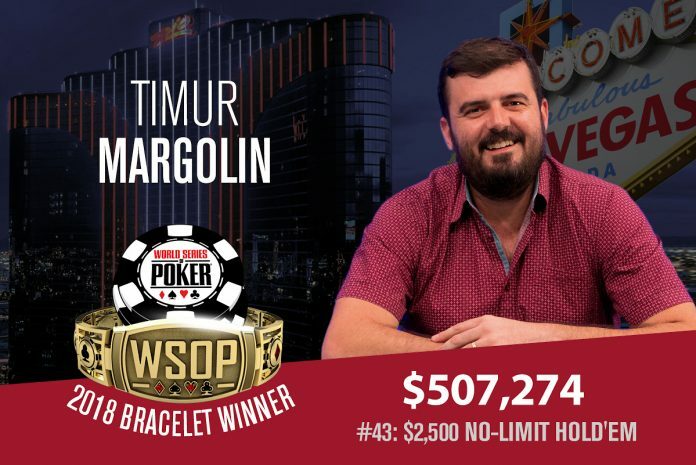 Timur Margolin emerged victorious for $507,274 in Event #43: $2,500 No-Limit Hold’em, outlasting not only the aforementioned players – Chris Ferguson and Ryan Laplante – but also the 1,248 total field. Margolin defeated Germany’s Ismael Bojang heads-up to clinch the win. Although Margolin began with the chip lead, Bojang forged a comeback and at one point had a 2:1 chip lead himself. This was bad news for Margolin as he knew what it was like to finish runner-up, having finishing second in this very event back in 2015. Margolin would manage to regain control though, and in the final hand Bojang jammed with ace-deuce suited and was called by king-queen off. A king hit the flop, while Bojang flopped a gutshot to a wheel, but the queen turn and brick river ended it all. Out of the 402 entries in Event #46: $2,500 Mixed Omaha Hi-Lo 8 or Better/Seven Card Stud Hi-Lo 8 or Better, just one player remains with all the chips, a shiny new bracelet, and $214,291 in front of him. David Brookshire is the champ in this one, having come into the final day ninth of 15. Things went well from the off, but when they got down to six it was Brendan Taylor who held the chip lead with more than half the chips in play. He’d bust Tyler Groth in fifth and Ian Shaw in fourth to extend that lead, before Brookshire felted Daniel Ospina in third to set the heads-up match. Brookshire was at an 8:1 chip disadvantage, but managed to chip up before securing a huge double up. From there, it was all Brookshire until the last hand was dealt. Taylor had flopped two pair and got the money in, but Brookshire flopped the nut straight which held. “It’s really emotional. It feels so good to win after Brendan had an 8:1 chip lead on me, and then coming back,” Brookshire said afterwards. “Kind of felt like he had it in the bag and was praying real hard inside while I was playing. I felt really blessed to be able to make a comeback and pull out the win. After yesterday’s Day 1A, Sunday was time for Day 1B in Event #48: $1,500 No-Limit Hold’em MONSTER STACK. A massive field of 4,014 gathered to try their luck in this one, and when the bags were brought out ten levels later just 1,362 remained. They’ll now join the 723 survivors of 1A tomorrow, with 2,085 total coming back for Day 2. Registration is now closed, meaning the $8,451,000 prize pool is now set in stone. It will be split between the top 939 players, with a min-cash worth $2,251. However, there’s $1,037,451 up top for the eventual winner. After today’s action, the big stack belongs to Jeffery Trudeau with 193,800. Other notables to advance Sunday include 2015 Main Event Champion Joe McKeehen (129,800), Boris Kolev (108,300), Ronnie Bardah (68,000), Athanasios Polychronopoulos (63,400), Manig Loeser (58,100), DJ MacKinnon (56,500), Ana Marquez (52,100), David Bach (49,200), and Gaurav Raina (47,900). Day 2 begins at 11am tomorrow. Two-time bracelet winner Ryan Hughes ended Day 1 of Event #49: $10,000 Pot-Limit Omaha 8-Handed Championship with the chip lead, and now after another full day of play he remains at the top of the counts. Day 2 began with 175 players returning, and now just 37 advanced to tomorrow’s Day 3. Hughes increased his stack from 475,400 to 2,366,000, and he’s followed by three-time bracelet winner Rep Porter (1,700,000). Bracelet winners Brandon Shack-Harris (1,200,000), Ryan Laplante (672,000), Loren Klein (514,000), Scott Bohlman (457,000), Martin Kozlov (389,000), Richard Gryko (347,000), and Mike Leah (269,000) also advanced. Two more notable ended the day with top 10 stacks. Five-time bracelet winner Scotty Nguyen ended with 897,000, having finished third in the $25K PLO High Roller on Saturday. Podcast host, YouTuber, and PLO fanatic Joey Ingram has also been testing his skills in the live tournament arena, ending the day with 749,000 – good for tenth right now. The final 37 will be back at 2pm tomorrow. All eyes are on the $1,018,336 first-place prize, but right now they’ve all locked up $21,028. Sunday saw the beginning of Event #50: $1,500 Razz play out, with 389 hopefuls cut down to 118 survivors across ten levels. Victor Shalom can call himself overnight chip leader, bagging up 76,600. He’s most closely followed by Richard Sklar (61,000), John Beringer (59,800), Kyle Montgomery (56,000), and Bijan Mirzasafi (54,000). Adam ‘adamyid’ Owen just missed out on a top five stack, ending with 52,300. Meanwhile, multiple bracelet winners Julien Martini (45,000), Benny Glaser (44,800), and Ylon Schwartz (41,000) ended in the top 20. Phil Hellmuth is also still in the running for his 15th bracelet, bagging up 17,500. If anyone can make a comeback it might be Hellmuth, as his record in WSOP Razz events is pretty astonishing: four final tables, two bracelets, and a runner-up finish. Action resumes at 2pm Monday, with $125,431 up top and a min-cash worth $2,244. The bubble will burst at 59 players. The fantastically named Hero Aguiluz has ended Day 1D of Event #11: $365 PLO GIANT Pot-Limit Omaha as the chip leader. Aguiluz bagged up 1,275,000 after 21 levels of play. There were 565 entries today, with just 33 advancing to Day 2. Others who made it through include Daniel Laidlaw (1,050,000) Gonzalo Mercade (1,045,000), Vincent Moscati (590,000), Matt Stout (500,000), Men Nguyen (470,000), and Pete Chen (175,000). There’s one more staring flight next Sunday, before Day 2 begins on Monday July 2nd. Looking for some poker to play in Vegas on Monday June 25? Well, here’s what’s happening within the Rio at the WSOP. At 11am, you’ve got Event #51: $1,500 No-Limit Hold’em Bounty kicking off. Players receive a $500 bounty for every player they eliminate. Then at 3pm, you’ve got Event #52: $10,000 Limit Hold’em Championship. Expect a lot of the big names battling in that one.